﻿ Dee Finney's blog November 17, 2012 page 378 10 SHOCK - EARTHQUAKE? 11-17-12 - DREAM - I was near a large body of water, and there was a fish shanty there, so old and weather beaten, the wood was black. The door to the fish shanty was open, and some large cats went into the door opening and each cat dragged out a large fish by the tail, and these must have been older fish because the skin came right off and I marveled at how perfectly the body of the reddish bodied fish looked, each fish so perfectly formed with muscle and flesh delineated into small sections. I figured the fish had to have been getting rotten to come out of their skins so easily. I woke up suddenly and a voice in my head said,"10 SHOCK!" NOTE: On thinking about this dream, apparently there were three fish. Interestingly, there were a couple crop circles with three fish in them this year. One of them was considered 'sun' fish. The sun has been very prominent this year - namely the solar eclipse we just had. 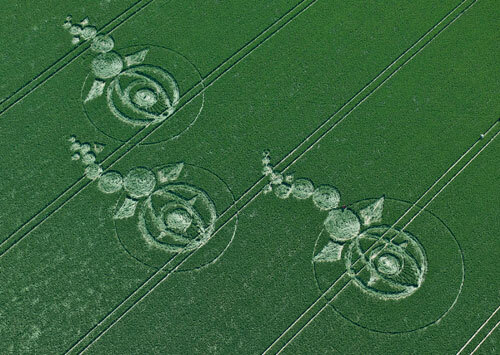 We didn't follow up on that trail, so that is all we posted on that crop circle back then. NOTE: This dream occurred before midnight, actually on the 8th. Joe and I had been discussing weird events in our lives during the past two years.... seemingly ET events, implanted dreams, visions, strange lights and sounds. The dream following occurred within minutes of that discussion. 11-9-99 - DREAM - Joe and I were in a house somewhere in California, we were discussing events which had occurred and prophecies of events to come. We then went out to a car and continued the discussion in the car. We were driving along a two lane highway, headed downhill toward the ocean which seemed to be rising and coming over the road as it made a left turn around a large rock up ahead. It would have had to be the Coast Highway. I heard a double beep sound like a big truck was passing us from behind, however when I looked behind us I didn't see anything. I looked ahead and wondered if there was a place to pull over and stop. Just then, an overwhelming shaking started, the air started to go black, and I felt like I and Joe were flying backwards and upwards in the air, inside the car. I started screaming, "What's happening?" but no sound was coming out of my mouth. I was screaming too loud for my throat to even comprehend what I was asking of it. As I woke up screaming I could still feel the tremendous shaking of my body inside the dream, but I was conscious enough to know it was not my physical body and I was not having an epileptic attack or something. There was also no shaking of the bed... all the movement was inside the dream. It was so violent, I knew that it was far more dangerous than the earthquake house I had seen demonstrated on television just last week. In the show, the earthquake demonstration was shaken at a 5.0 level and then an 8.0 level. I couldn't believe how destructive it was. Compared to that, the shaking I experienced in the car in the dream was a 10+. I told Joe about the dream and we both went back to sleep. In the following dream, I was creating a web page about the earthquake dream. Sandwiched in between two sections of the page there were drawings of two seal outlines. One was facing left and one was facing right. They were right above each other but going in opposite directions. After I got up, I looked in the Book of Revelation to see what the second seal was. There is no comparison of events at all. So, the two seals refers to something else. The visual impression of the two seals may indicate the amount of slippage between one tectonic plate and the other as well as the compression of the plates one atop the other. A mega earthquake prediction it may happen around the next lunar eclipses November 28th 2012 maybe according to updated relevant lunar eclipse data: News TARGET DATE NOVEMBER 28TH 2012 it would be wise to take a earthquake precaution around on this date for people that live in earthquake hot spots. NOVEMBER 28, 2012 – is a target date for a earthquake to happen? Yes there was a large 7.7 earthquake in the queen Charlotte b.c canada on the weekend but it was a slider quake this is why it never caused any damages; perhaps its a prequel to to a much larger mega earthquake that is ready to go around on november 28th 2012? according to some earthquake research data. 7-8-12 MEDITATION: I heard five loud knocks in my left ear and saw the word 'BLACK'. I said mentally, "I'm sorry I don't open the door for anything black." I then saw a large, wide computer screen with a lot of typing on it in three colors of typing, red, white and black, and the black was larger and darker and bolder than the rest of the type, but being off to the left, I couldn't read it and I didn't want to shift my eyes and lose it completely, so I said mentally, "Please shift the screen to the right and clarify the print." The screen then shifted to the center of my gaze and became slightly smaller but it still couldn't read the screen, even though the black sentences were extra large and bold. The screen then changed to a smaller size. It had less print on it and less black, bold print. Then a fourth screen came up with less bold and black print. November 28th is the day before Thanksgiving, though I distinctly heard the words Black Friday, which is normal shopping words for the day after Thanksgiving, but in this case might have a different connotation. Because of some other dreams I had just before the meditation, I related it to the 2012 election which Obama won. I know I had a dream but I could not recall it, instead the middle of my palm itches. This reminds me of my dream on 22 April 2007 that the Crucifix was shedding tears. I touched it with my right fingers to be sure if it was really tears and they became wet down to my palm. I asked the Lord why He was crying, His answwer "A big catastrophe is about to happen". Immediately my aunt (where I visited in this dream) lit a candle then we knelt down and prayed together asking the Lord to protect our family, friends and people around the world, I woke up. My observation since that dream that everytime my palm itches, there is disaster happening or about to happen within 3 days. It depends what part of my palm. The upper part is in America, the middle is in Europe/Middle East & Asia and the lower part is in Australia/New Zealand. Since mid October almost everyday my palm itches. KEEP PRAYING. people holding on to his or her legs, and more people hanging onto to them. real life... you do freeze in terror!" try to get Janet's out very soon as these seem quite pertinent. Several with very good psyhic insights have been anticipating a Christmas Hammer this year. Magnetic Trimester (12/20 date) has been associated with the 12/26/2004 monstrous 9.5 quake in Sumatra, and increased quake activity in 2007 and 2010 in December. These are anticipated, by those psychic, to be worldwide, not local to one place. Gray skies indicates some volcanic activity. Center of the continent - the New Madrid precursor quakes. Both coastlines, figures in. Thanks for sharing. We are also speculating that a temporary severe wobble might be involved. NASA is really holding back on getting honest about Nibiru. They need to be forced, and Obama cannot risk the Electoral College not voting him in on 12/17. CIA assholes clinging to the coverup. May they experience true Karma in all of this. from my loved ones. I wanted to be with my family as I didn't know if they were safe or not. mourning from the depths of my soul. I began to cry with a wailing coming from down deep inside. 2 Small Earthquakes Strike Heart of Los Angeles!!! NEW MOON AND POSSIBLE ECLIPSE FOR NOVEMBER 13, 2012!!! Big Alert!!!??? On the day of the Northridge Earthquake of January 17, 1994, I immediately began to research all of the things that might have had something to do with that major earthquake. The first thing that I discovered was that in the days prior to the Northridge Earthquake the entire country had been experiencing severe winter conditions. These consisted of sub-zero temperatures, two feet of snow all across the country, and fifty-five mile per hour winds as well as four feet of snow in the Sierra Mountains. I thought it believable that the combination of all these things could possibly have affected the North American Tectonic Plate in such a manner so as to cause some sort of breakage or shaking out at the tectonic plate boundary on our West Coast and so I continued on in my research. I next headed to my local library with the names of a few different historical earthquakes to see what all preceded them and discovered something completely different all together. I discovered that the vast majority of major earthquakes were actually not preceded by severe winter conditions, which I deemed could affect the movement of the tectonic plates, rather most of the remaining earthquakes that I researched on that day had been preceded by the landfall of a major hurricane or typhoon. I didn’t have to think about it a real long time to be convinced that the tectonic plates were being moved by all of these different things with the result of that movement being major earthquakes. I continued on in my research, everyday adding a few different major earthquakes and sometimes even researching a major hurricane from throughout history just to see if it would actually be followed by a major earthquake at some point. It wasn’t too far along in this research that this process quickly became streamlined into just a few moments on a microfilm machine and my research for the day was quickly all completed. Sometimes as fast as about five minutes is all it would take me to pull out a roll of microfilm when I knew the date of a major earthquake or hurricane from looking it up in a brick and mortar encyclopedia. . . until I would find either a hurricane followed by an earthquake, or a major earthquake that had been preceded by a hurricane or typhoon making landfall. Of course a few still came up as “January Earthquakes” and had been preceded by severe winter conditions, exactly as the Northridge Earthquake where all this started. Later in 1994 a major hurricane named Hurricane John actually made landfall, or passed within 16 miles rather, of Johnston Atoll on August 25, 1994 and I began to write out my “EQ Alerts” and send them by U.S. Mail to my friends that I had worked with in the Motion Picture Business that had addresses in California and the Los Angeles area. Just 7 days later on September 1, 1994 there was around a 7.1 Richters earthquake that struck up around Northern California at Cape Mendocino. That was the year 1994 and I have been employing this system that I today like to call my “Precision Plate Tectonics Theory” ever since, frequently being as correct and accurate as I was in those days immediately following the Northridge Earthquake of January 17, 1994. Today I am writing to discuss the landfall of yet another major hurricane. This one is Hurricane Sandy that made landfall at the East Coast of the United States around New Jersey, and New York on October 29, 2012 with winds that had been reported as high as 120 mph while bearing just North of due West. Additionally there were just two earthquakes that have struck that immediate region of Hurricane Sandys landfall, those being a 2.0 Richters Earthquake in New Jersey, and a 2.0 Richters Earthquake in Connecticut on November 4, 2012 and November 5, 2012 respectively. While the usual use of the Richter Scale is as a nominal numbering system more commonly referred to as “2.0 on the Richter Scale,” I have modified my use of the Richter Scale to name the individual increments after the founder of the scale or “Richters.” This is a sort of naming method similar to such other scales named after Volt, Watt, Amp, Henry, and Etc. Hereinafter I may refer to the individual steps in the widely recognized Richter Scale. . . as 1 Richter, 2 Richters, 3 Richters or 4, etc. I think the naming of those steps in this manner is yet another advance that goes well with all these other great advances going on these days. In the now many years since I have employed my theories and wrote out my “EQ Alerts” I have had many good and great ones that have been very accurate. The landfall of Hurricane Hugo was on September 21, 1989 and the World Series/Loma Prieta Earthquake then struck on October 17, 1989 on Day 26 after that landfall. Day 26 after the landfall of Hurricane Sandy at New Jersey will fall on November 24, 2012 and I might expect this Brand New Upcoming Major Earthquake, which could well be the next big California Earthquake, to strike at between 7 and 7.9 Richters before that day, or by the end of November 2012. Thereby saying it should take about the same amount of time for the energy from Hurricane Sandy to cross North America as it took for similar earthquake energy to cross North America in the days following the landfall of Hurricane Hugo. Other such huge windstorms that I have also tracked that became huge major earthquakes are Cyclone Nargis at Myanmar/Great Sichuan China Earthquake, Hurricane Katrina/Great Islamabad Earthquake, and Super Typhoon Nanmadol/Great Sumatra Earthquake of 2004. Each of those were big windstorms that had major landfalls where the resultant earthquake energy lead directly to the epicenter of a major earthquake just a few days later. Similarly the landfall of Tropical Cyclone Yasi at Queensland, Australia on February 3, 2011 preceded both the Great Christchurch Earthquake of February 22, 2011 and Great Honshu Japan Earthquakes of March 11, 2011 although in the case of the Japan earthquake it appears to have dealt more with basic tectonic plate movement than my usual straight line theory. Christchurch is situated directly in the wake of the line of energy that would have been created by Tropical Cyclone Yasi. Ironically I have a great Twitter message or “Tweet” as well as an EQ Blog entry that you can still view containing the name of the town Christchurch in the headline. Those are at www.earthquakealert.blogspot.com and www.twitter.com/eqalert where you can scroll back to them dates and view those entries. In addition to the name of the town of Lompoc, California which has had at least one major historical earthquake in 1927, and could be in for another, I want to give a few other town names that might also become the epicenter of this Next Big California Earthquake! Those town names are as follows: Santa Barbara, Santa Maria, Orcutt, Arroyo Grande, Paso Robles, Goleta, Santa Barbara Channel, Ojai, Santa Paula, Fillmore, Tehachapi, Bakersfield, Lake Isabella, Arvin, Mettler, Coalinga, King City, Carmel, Carmel Valley, Hollister, Gilroy, Morgan Hill, Hayward, Daly City, San Francisco, South Lake Tahoe, Mammoth Mountain, Bishop, Owens Lake, Ridgecrest, Lone Pine, Shafter, Wasco, Avenal, Lake Nacimiento, Mono City, Big Pine, Independence, Olancha, Coso Junction, Indian Wells, Boron, Trona, Argus, Panamint Valley, Panamint Springs, Dolomite, Stove Pipe Wells, Death Valley Junction, Los Angeles, Landers, Hector Mines, Acton, Littlerock, Pearblossom, Wrightwood, High Desert, and Ludlow, California. Also Goldfield, Bonnie Claire, Las Vegas, and Incline Village in Nevada. This list of towns is meant to illustrate the general region where this earthquake will most likely strike and while you will surely say that it is all inclusive, it merely only gives the names of towns that are WITHIN the exact line of earthquake energy that is traveling across the United States from New Jersey in accordance with my “Go Straight Theory,” where I track such energy by following a straight line normally with the use of a globe since maps do not inherently have the same spherical abilities. Thank-You for accepting all of my earthquake writings and be watching for this major earthquake which probably WILL NOT miss the California Region discussed herein. Major Earthquake Alert: California!!!!! Here's Those Towns!!! New Very Big EQ Alert: Lompoc, Los Olivos, Santa Ynez!!!!! Small Windstorm=Small Earthquake, Big Windstorm=Big Earthquake, HUGE Windstorm=HUGE Earthquake, and BIGGEST Windstorms=BIGGEST Earthquakes! Hurricane Sandy will be enough New Earthquake Energy to almost guarantee a Major Earthquake around Southern California in the coming days!!! After landfall of Hurricane Sandy at New Jersey, I now expect this "New" Earthquake Energy to cross U.S. for about 6.5 Richters Los Angeles! Hurricane Hugo made landfall at Charleston Sept. 21, 1989 the World Series Quake followed Oct. 17. almost a STRAIGHT LINE across the U.S.!!! NEW EQ Alert: Lompoc, Santa Barbara, Los Angeles!!! 7.7 Queen Charlotte!!! Hurricane Sandy Making Landfall!!! MORE Earthquake Energy Coming!!! NEW: Unofficial Opinion For Major Earthquake East Coast!!! New Major Alert: Washington, DC, New York, Boston Regions!!! The landfalls that I have just observed to be taking place at Jamaica, and Cuba of Hurricane Sandy, appear to probably be a fairly large amount of new earthquake energy that will be crossing just past Charleston, NC, and then crossing North America straight through Chesapeake Bay on a route just a degree or two East of Due North. This line will cross just west of New York and continue on North on a line that crosses West of Boston and on North. I will update this information in the coming days, but as of tonight Hurricane Sandy had just been upgraded to a Category 2 Hurricane and had a huge well defined eye as it made landfall at far east Cuba just east of Guantanamo Bay. Those islands are already under an alert and Official Prediction and will ALSO be affected by this new one!!! Could go as high as 7 Richters, although the other one may not have been as high. . . this one not only increases the Magnitude, but also increases the chances of something major shaking as well. There will be a certain amount of trouble with the energy traveling this route past Charleston. A few of the places that this new earthquake energy will be crossing are what I might consider "Shaky Places" and I don't think that needs any additional explanation. I have mostly studied books about earthquakes and started out working at a junk-yard, advancing to an Apprenticeship, but that is the sum total of my education along this lines. I also hold a certificate from acting school in Chicago from 1989-1990. I am by no means a Degreed Seismologist, rather a very good Amature Seismologist.